There are often disparities between current evidence and current practice. Decreasing the gap between desired practice outcomes and observed practice outcomes in the healthcare system is not always easy. Stopping previously recommended or variably recommended interventions may be even harder to achieve than increasing the use of a desired but under-performed activity. For over a decade, aspirin has been prescribed for primary prevention of cardiovascular disease and for patients with the coronary artery disease risk equivalents; yet, there is no substantial evidence of an appropriate risk-benefit ratio to support this practice. This paper describes the protocol of a randomized trial being conducted in six primary care practices in the Denver metropolitan area to examine the effectiveness of three interventional strategies to change physician behavior regarding prescription of low-dose aspirin. All practices received academic detailing, one arm received clinician reminders to reconsider aspirin, a second arm received both clinician and patient messages to reconsider aspirin. The intervention will run for 15 to 18 months. Data collected at baseline and for outcomes from an electronic health record will be used to assess pre- and post-interventional prescribing, as well as to explore any inappropriate decrease in aspirin use by patients with known cardiovascular disease. This study was designed to investigate effective methods of changing physician behavior to decrease the use of aspirin for primary cardiovascular disease prevention. The results of this study will contribute to the small pool of knowledge currently available on the topic of ceasing previously supported practices. Cardiovascular disease is the leading cause of death for men and women in the United States. In 2002, the United States Preventive Services Task Force (USPSTF) began recommending low-dose aspirin as a primary prevention measure in patients at high risk of developing coronary artery disease . 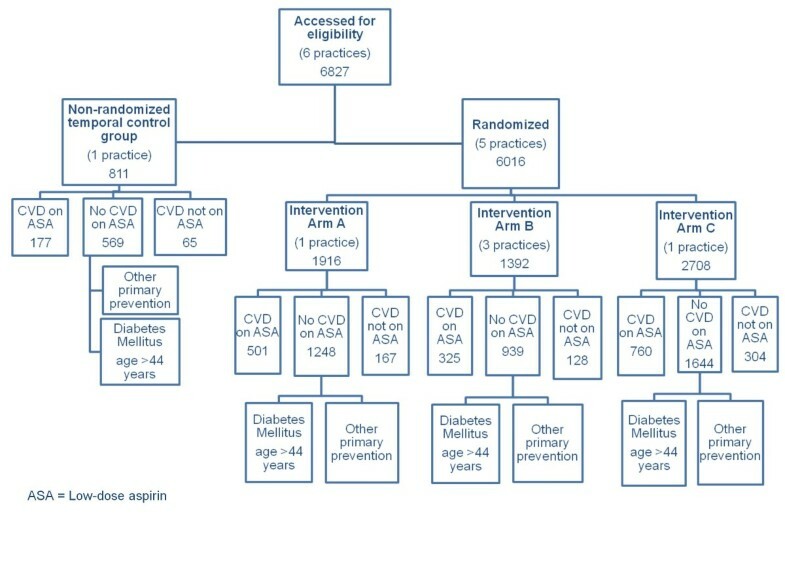 However, there are many well-designed studies that do not support the use of aspirin for primary prevention of cardiovascular events in patients with no known coronary artery disease [2–6], including patients with conditions considered to confer a risk equivalent to coronary artery disease, such as diabetes [7–9], peripheral artery disease , and chronic kidney disease . Meta-analyses of many studies have also shown inconsistent results [11–13]. In addition to the uncertainty of efficacy, research has shown that the benefits of low-dose aspirin for primary prevention may not appropriately outweigh the harms . The Food and Drug Administration (FDA) has denied requests to approve aspirin for the primary prevention of cardiovascular events twice, once in 1998 and again in 2003, due to lack of evidence supporting its efficacy [15, 16]. Since 2003, no new large studies that support the use of low-dose aspirin therapy have been published, though several that do not demonstrate a protective effect of low-dose aspirin have been completed [4, 7, 8, 10]. However, aspirin has continued to be recommended for this use by the American Heart Association , the USPSTF , the American Stroke Association , and the American Diabetes Association , and is prescribed for primary prevention by physicians worldwide. There is often a disparity between current evidence and current practice, but making changes to the system can prove difficult. Research has revealed that physicians' behavior is relatively resistant to change due to a variety of internal and external factors [20–24]. However, some interventional methods have been more efficacious than others. Mere passive dissemination of information is typically ineffective, whereas active interventions have been shown to be more successful [25–27]. While many physicians believe that clinical guidelines are beneficial to their practice and patient outcomes [28, 29], clinical guidelines alone do not seem to impact physician behavior . Furthermore, guidelines that recommend the elimination of old behavior may be more difficult to implement than guidelines that recommend the addition of a new behavior . Sittig, et al. conducted a study to test clinical decision support systems on reducing the use of inappropriate medications in various groups of patients . The study added to the evidence that clinical decision support systems are effective [25, 31, 32]. Reminders that utilize similar electronic systems [27, 30, 31, 33–35] and educational outreach (i.e., academic detailing) [25–27, 30, 34, 36] have produced significant results. Interventions that are patient mediated have been successful as well . Multi-faceted techniques involving two or more interventions have also proven more effective than single interventions [25–27, 30, 34, 36]. Until recently, all primary care physicians within the University of Colorado Hospital ambulatory system received reminders through a clinical decision support system to consider aspirin therapy for all patients with diabetes mellitus, peripheral artery disease, chronic kidney disease, or a calculated Framingham Risk Score >20%. Based on the lack of evidence supporting this practice, the group of Family Medicine and General Internal Medicine physicians overseeing this system decided to remove the reminder message from the electronic medical record. No active, systematic approach to stop this previously recommended behavior has been undertaken. Members of the Clinical Decision Support group indicated that they believe simply discontinuing the recommendation would have no impact on clinical care, and that the use of low-dose aspirin for primary prevention would otherwise continue. Therefore, this study was designed to actively disseminate to clinicians the new University of Colorado Hospital primary care recommendations regarding the use of aspirin for primary prevention. Test the effectiveness of these interventions to improve the evidence based use of aspirin for primary and secondary prevention of cardiovascular disease using a three arm randomized trial. Academic detailing, plus the physician message, plus a patient activation form that includes a message to the patient to ask his or her physician about use of aspirin for primary prevention. The academic detailing presentation (http://www.dartnet.info/media/LowDoseASAandCVDpreventionSlides.pdf) and one page information sheet (http://www.dartnet.info/media/LowDoseASAEvidenceSummaryforClinicians.pdf) are available online. There will be no significant difference in the percentage of patients with known ischemic heart disease treated with low-dose aspirin between the three arms of the study at baseline and at the end of the study (i.e., there will be no erosion in the appropriate use of aspirin due to the intervention to decrease aspirin use for primary prevention). Academic detailing with the point-of-care message for clinicians as described in arm two above, and a short patient activation form to be given to patients prior to a visit, which asks them to check with their provider concerning their use of aspirin for primary prevention. The academic detailing consisted of a presentation to the clinicians and staff of each office by the study principal investigator and co-investigator (for larger practices more than one presentation was made), as well as the development and distribution to all primary care clinicians of a one-page information sheet concerning the lack of evidence for low-dose aspirin for primary prevention of cardiovascular disease (CVD). The patient activation form, shown in Additional File 1, was requested by one of the primary care practices prior to this study. All messages on the form, including the aspirin message, were reviewed by clinicians from all primary care practices. Practices were free to request that the forms be turned off at any time during the study, but none did so. One primary care practice in the system elected to not receive the academic detailing or to participate in the project. This practice will be utilized as a non-randomized temporal control for the intervention practices. An interim analysis will be conducted at six months and the final analysis will be conducted at 15 to 18 months. All practices involved in the study were divided into three groups to match the number of patients at baseline on aspirin for primary prevention as closely as possible. After the academic detailing was completed at all sites, practice names were placed on identical cards and blindly drawn from a box by a study team member to allocate them to the patient activation, clinician-only reminder, and academic detailing alone groups. The consort diagram of number of patients randomized to each intervention is shown in Figure 1. CONSORT diagram of the study. Pre-intervention data were collected through the electronic medical record system (N = 6,827). Patients were separated into categories based on two criteria as listed in their charts: a once daily dosing of low-dose aspirin and a diagnosis of CVD based on appropriate International Classification of Disease, Ninth Revision (ICD-9) codes (both coronary artery disease and thrombotic cerebrovascular disease). Persons who met both criteria were classified as 'CVD and on aspirin' (N = 1,763). Persons who met the criteria of low-dose aspirin but had no associated cardiovascular diagnosis were classified as 'No CVD but on aspirin' (N = 4,400). Those who had no documentation of aspirin or other anti-platelet therapy, but who carried a cardiovascular diagnosis were classified as 'CVD but not on aspirin' (N = 664). The study is targeted to change care in the 'No CVD but on aspirin' group specifically, but will observe the 'CVD and on aspirin' and 'CVD but not on aspirin' groups to monitor for any change, particularly an unwanted drop in use of anti-platelet aspirin therapy in patients with known CVD. For the outcome variable of change to recommended aspirin therapy, a sample size of 800 per arm provides 80% power to detect a 7% difference between any two groups. We believe that any change under 10% is not clinically significant; therefore, the ability to show an even smaller statistically significant change indicates that this study has enough power to detect meaningful change in aspirin therapy. Our pre-intervention data were collected using the University of Colorado Hospital's Allscripts database and the QED Clinical, Inc. (DBA-CINA) Clinical Data Repository maintained by the Department of Family Medicine. Our post-intervention data will be collected using the same system. The intervention will run for 15 to 18 months. The primary end point of this project is the number (and percent) of individuals currently on aspirin therapy for primary CVD prevention that stop this therapy and do not receive a new CVD diagnosis. All practices in this project perform regular medication reconciliation at virtually all visits; thus, aspirin therapy is regularly recorded in the patient drug list. Electronic health record (EHR) data can reasonably identify patients on aspirin as well as identify those individuals with an appropriate diagnosis for this therapy. Thus, we will conduct our analyses at the patient level. Primary analysis will be based on the 'No CVD on aspirin' cohorts by intervention arm. Secondary analyses will include a comparison to the temporal control and sub-group analysis comparing individuals with diabetes mellitus, peripheral vascular disease and chronic kidney disease versus all others in the 'No CVD on aspirin' cohort. Data are available to calculate a Framingham risk score  for essentially all participants without a 'CVD equivalent' diagnosis. If there is a differential effect between the CVD equivalent and all others in the 'No CVD on aspirin' cohort, a sub-analysis that includes the Framingham risk score will be undertaken. An interim analysis conducted at six months did not demonstrate any decrease in aspirin usage among patients with a CVD diagnosis, a predetermined early stopping point. The primary analysis will include only patients identified as being on aspirin prior to 1 April 2009, when the decision support aspirin message was changed. Aspirin therapy status will be evaluated at six and twelve months after the intervention is initiated at each site. The outcome variable for the analysis will be presence/absence of aspirin therapy at final observation time. We will use a logistic regression approach to determine whether likelihood of aspirin cessation differs among treatment groups, adjusting for clinic (fixed effect), and patient clinical and sociodemographic covariates (age, gender). Time from baseline to last observation will be included as a covariate in the primary analysis. Patients who do not have a follow-up visit during this period will initially be excluded from the analysis, but a sensitivity analysis will be performed, assuming patients with no follow-up visit are still on aspirin therapy. Clinic will initially be included as a fixed effect in analyses because the total number of clinics is too few to achieve stable estimates of covariance components for multilevel modeling. However, additional analyses will be carried out using multilevel modeling with patients nested within physicians because there are an adequate number to include physician as a random effect. Additionally, we will explore using a Cox proportional hazards model with time to cessation as the outcome. This study was approved by the Colorado Multiple Institution Review Board. It was also registered on ClinicalTrials.gov, identifier: NCT01247454. The study was granted a waiver of consent at the patient level. One of the six practices withdrew from the study prior to the randomization and implementation of the interventions, reducing the patient size (N = 6,016). For this practice, the primary prevention reminder was stopped within the point-of-care clinical decision support system. This practice was treated as a non-randomized temporal control for the intervention practices. Even without randomizing this practice, the power of the study will remain sufficient. Much research has been done regarding physician behavior change and implementation of new techniques, treatment, and therapies. However, there is not a great deal of literature surrounding effective methods for discontinuation of current practices. Effecting a change in aspirin usage in one or more groups will result in a better understanding of the approaches and efforts needed to stop the use of a previously recommended therapy. If a change in aspirin usage is not detected, a follow-up qualitative analysis at the provider level may provide a better understanding of why providers and patients were unwilling to stop a potentially harmful treatment. We would like to acknowledge Miriam Dickinson, PhD, Keith Spilman, and Kelli Giacomini for their contributions to this study. BF conceived the study, conducted the academic detailing, and drafted the manuscript. BL planned, described, and will conduct the statistical analysis. ES participated in the design of the patient activation form and helped to draft the manuscript. WP participated in the design of the study and the patient activation form and helped to draft the manuscript. All authors read and approved the final manuscript.